For some unknown reason my mate in Bristol made me godfather to one of his children. As part of my godfatherly duties (well my only one really) I take said godson to a sporting event each year around his birthday. 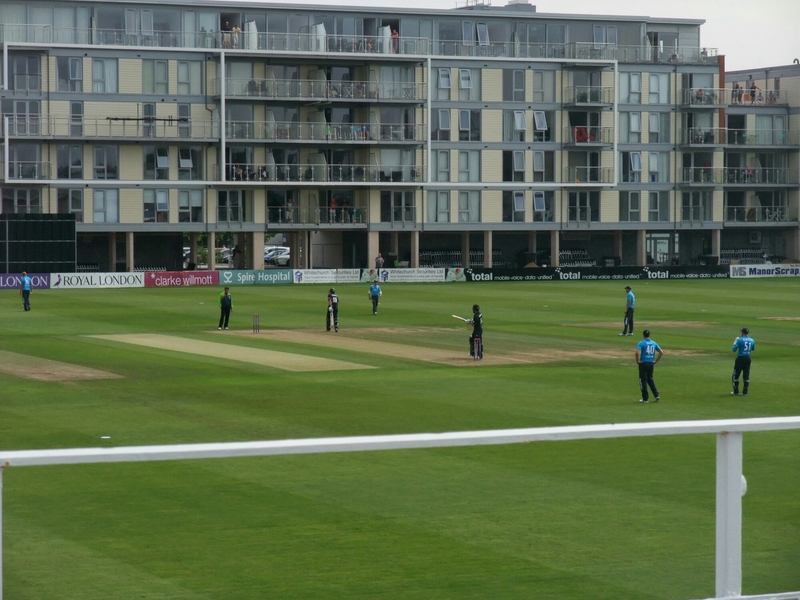 Last year it was Cardiff Blue’s home win againt Toulon in the now defunct Heineken Cup and this year, after struggling somewhat with dates, me and his father eventually settled on cricket in the form of a one day game in Bristol between the England Lions and New Zealand A. It was a rather good game featuring 2 centuries and an exciting run chase by England after New Zealand posted a formidable total (England lost) which as it was rain free and quite sunny (it has taken me a while to get around to writing this post up) made for a very pleasant day. Part of the deal was the godson was free to choose where we ate, subject to it being within walking distance of the cricket ground. This initially filled me with dread as previously he have told me how much he likes these all you can eat food factory places (Cosmo and its ilk – never been to one and hoping never will). 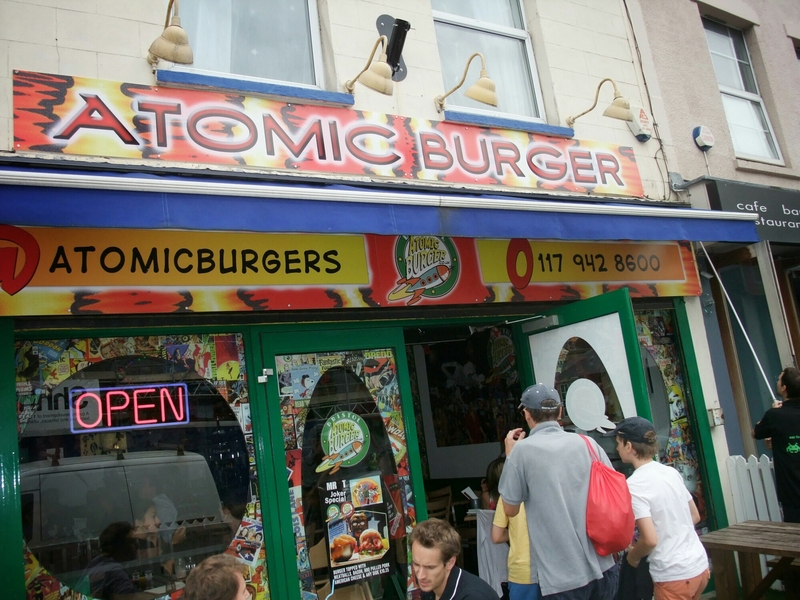 Thankfully these were located miles away, so he plumped for a place called Atomic Burger. On looking the place up on the Internet, my initial fear that it would be a Macdonalds clone was replaced with an “hang on, this might not be half bad”. 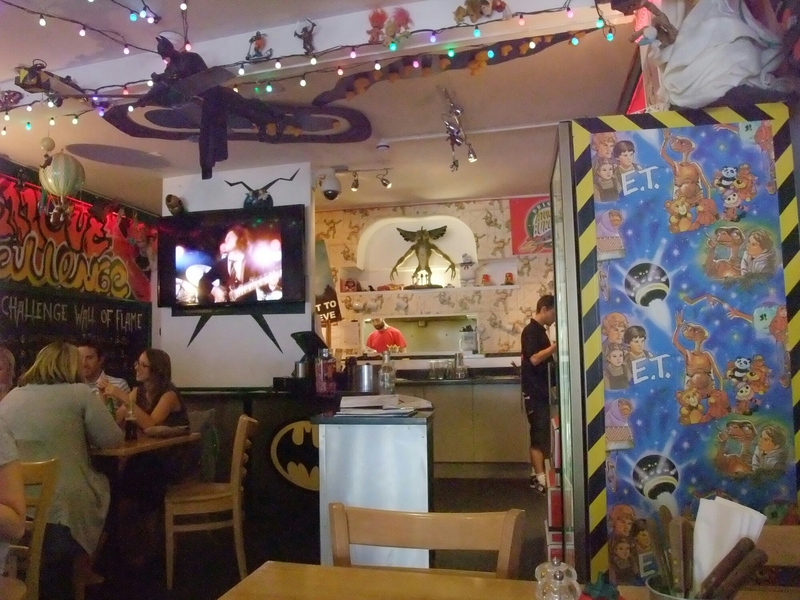 The décor in the place is pure geek heaven, with the walls, ceiling etc. plastered with pictures from 70s and 80s cartoons and films. Think Thundercats, He-Man and, my personal favourite from that era, the classic Battle of the Planets . 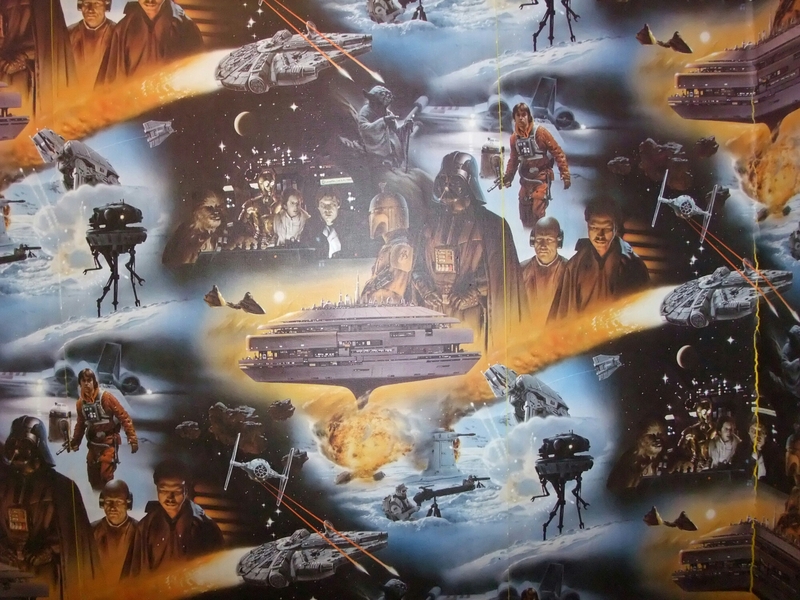 Even the mens loos were so adorned, this time with a montage of Star Wars – The Empire Strikes Back (clearly in my view the best film of the franchise) images. 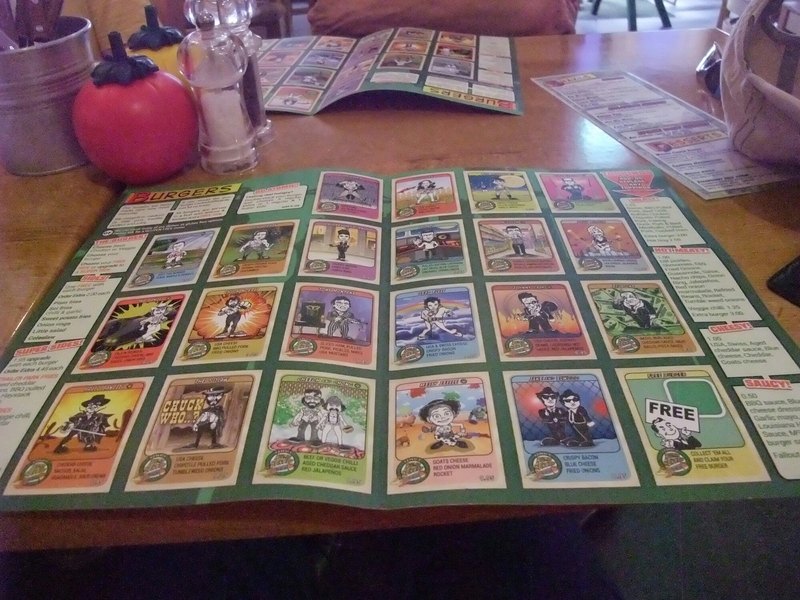 I spent some time happily identifying with the various images on the walls and explaining them to godson and his brother as we perused the rather lurid menu. So full marks for the wallpaper, but how about the food? Themed places tend to fall down on the food front, all to often concentrating on the look and forgetting about the thing that really matters, the food. Think the ghastly Planet Hollywood. Drinks wise you are looking at shakes (standard and shotgun “hard” shakes), soft drinks (including American classics such as root beer and cream soda), beers and wine. The list also included the rather alarming Zaphod – Flaming Gargle Blaster. This is limited to one only per person, very wisely based on what is in it. Dread to think what sort of hangover one too many (i.e. one) of these would induce. Presumably it is their take on the legendary Pan Galactic Gargle Blaster from Hitchhikers Guide to the Galaxy fame. 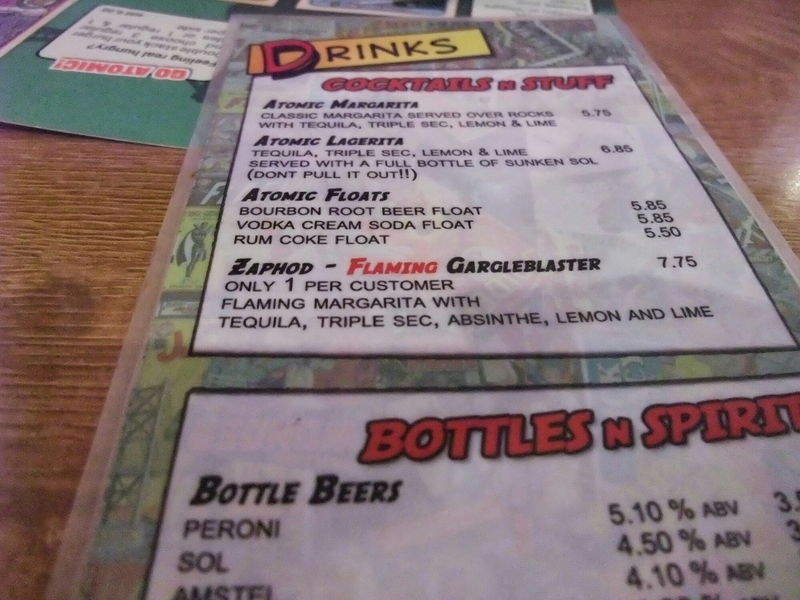 Oddly the Gargle Blaster only seems to feature on the in restaurant menu and not on the website menu. Not for the faint hearted that one. We passed on the appetisers and went straight to the burgers. These all had film/TV/celeb. 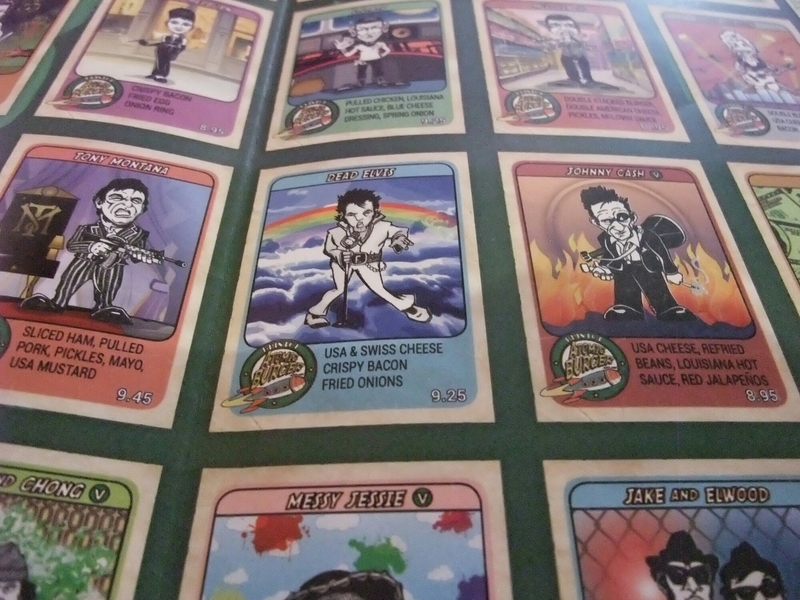 related names including the Daisy Duke (did it come with very lightly dressed buns I wondered) and the frankly terrifying Jack Burton (which was labelled as a burger topped with peking duck – really! – spring onions and cucumber – presumably as the character is from Big Trouble in Little China). I went for the Dead Elvis (£ 9.25 including a standard side of choice), which (notwithstanding the moniker thankfully it contained no peanut butter or jam/jello and didn’t involve me later expiring on the toilet) was a burger topped with Swiss cheese, American cheese, bacon and onions. The menu refers to burgers being cooked medium, with a touch of pink, unless otherwise requested. There was no evidence of pink in mine (I didn’t request otherwise), but it was a juicy burger topped with a good amount of melted cheese (cheese could have been a bit more melted if am being picky) that pressed all the right buttons flavour wise for me. The burger pattie itself was properly seasoned and had a nice beefiness to it, which is all to often lacking in beef burgers. The saltiness of the bacon added nicely to the mix. Whilst in no way threatening the Dead Hippie’s crown as my top burger, it was all in all a very satisfying burger. Bun wise this was a regulation white bap (back to Daisy again) which was perfectly adequate for its primary role of containing my burger pattie. A standard side (e.g. 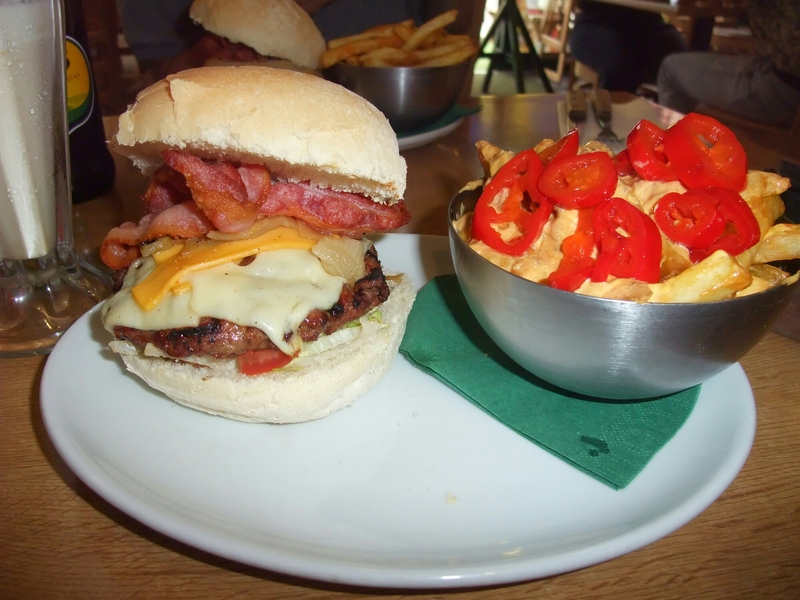 fries, onion rings etc) is included in the burger price, but you can upgrade to a Super Side for an extra £1.95. These included Dirty Fries, which had beef chilli, cheese sauce and supposedly jalapeños piled on top of a bed of fries. Whilst eating them make me very dirty indeed, the jalapeños were sadly lacking in any discernable heat. As they were liberally scattered raw (rather than being the usual pickled variety) on top this was very odd. I am not a chilli junkie and don’t have a massive tolerance to the chilli burn (either end) so the fact that I found them less than hot suggests they were not as advertised (I think they must have run out of jalapeños). I enjoyed the Dirty Fries, but the lack of any real chilli kick was a shame. 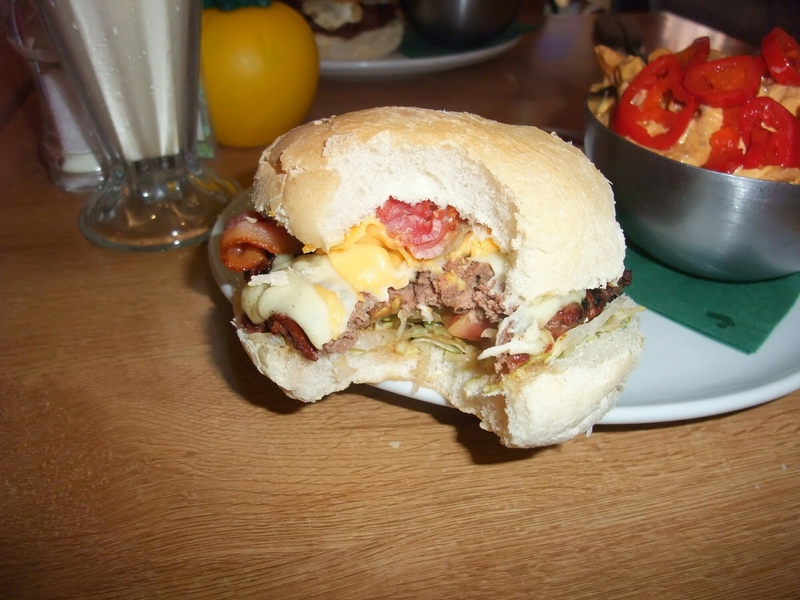 The boys both went for a Fritos Bandito (£8.95), a burger topped with cheddar, salsa, guacamole and sour cream. Predictable (as all children their age seem to be allegic to anything green) they didn’t want the guacamole on it. They also went for a chicken, rather than beef, burger despite me expressing my disapproval. They seemed to enjoy their meals, with pleasingly clean plates at the end. My mate went for the Audrey Hepburn burger. 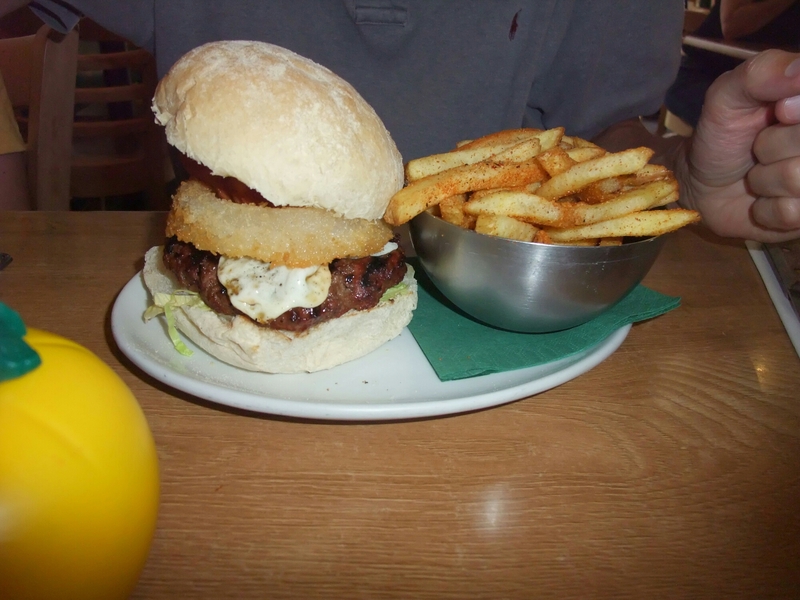 Based on its name (Audrey not exactly famed as a big eater) I was expecting a sprig of parsley on the plate and nought else, but it actually turned out to be a fried egg, bacon and onion ring topped burger. What that has to do with Audrey Hepburn who knows (bacon and eggs – Breakfast at Tiffany’s maybe – but where does the onion ring come into it?). Bit too much going on if you ask me, but my mate duly demolished it and pronounced it as very nice indeed. He opted for a side of sci fries (fries sprinkled with a chilli rub). Whilst suitably crispy they were a bit pedestrian heat wise (much like my dirty fries). On the drinks front, I had to go for a shotgun (hard) shake (£6.75) and settled on the more macho Vincent Vega (over the Ms. Mia Wallace). 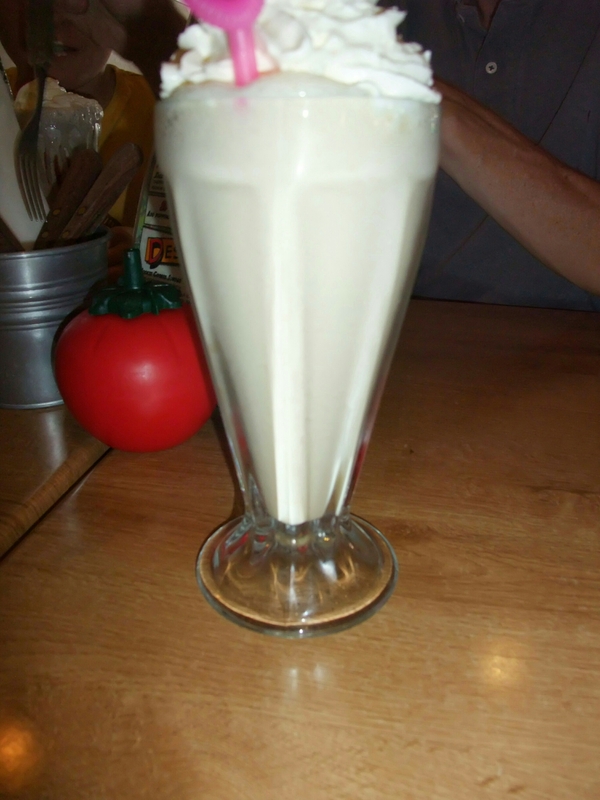 This bourbon augmented shake was the absolute bomb, with the double shot of liquor working really well along side the peanut butter, vanilla ice cream and cream. It was also suppose to have a cherry on top. I don’t recall mine having one, but who cares as I could have happily drunk a vat of the stuff. 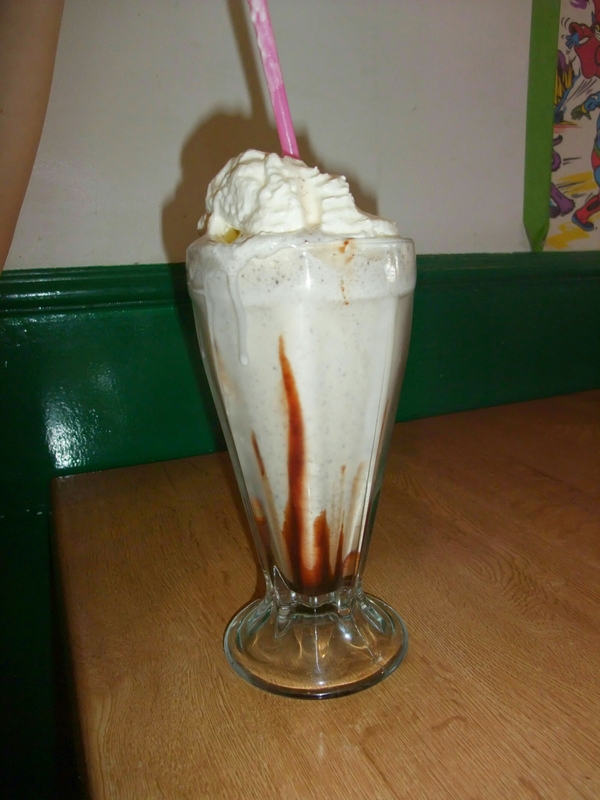 The boys went for the Cookie Monster (oreo cookies and cream) shake (£4.25) studiously ignoring my suggestion, for the wholly selfish reason that I wanted to try it, that one of them go for the Baconator (a caramalised bacon shake with cream – sounds rather good doesn’t it). After burgers, fries and shakes (plus beers at the cricket – me and their father rather than the boys) there was no room for desserts. For those interested they do gluten free meals on request (they strongly suggest pre ordering these). Veggies also seem to be well catered for. Missing jalapeños and cherry aside, I thoroughly enjoyed my meal at Atomic Burger. A good burger and a stellar shake made for a happy me. Would I go back? Definately. This place is great for kids and also for releasing the inner child in big kids like me. The food is pretty good as well. Great review…and definitely agree on Battle Of The Planets! I have the DVD boxset…can’t wait until my son is old enough to enjoy it! 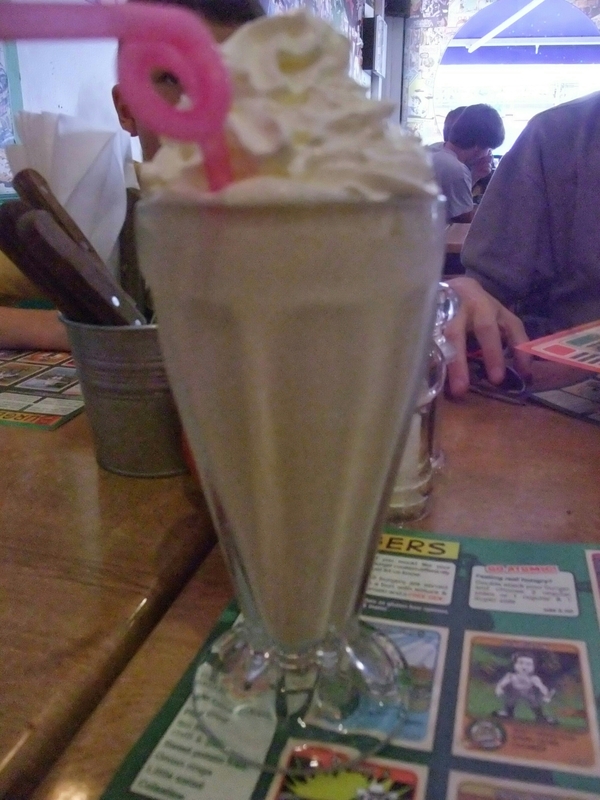 This entry was posted on Sep 14, 2014 by solicitingflavours in Alcoholic drink, American food, Barbecue, Bristol, Burger, Drink, Food, Food and wine products, lunch, Non alcoholic drink, Outside Wales, Restaurant Review.